PA Chairman Abbas leaves hospital, expects to be back at work on Tuesday. Palestinian Authority (PA) Chairman Mahmoud Abbas, 83, was released on Monday after being hospitalized in a Ramallah hospital for nine days. 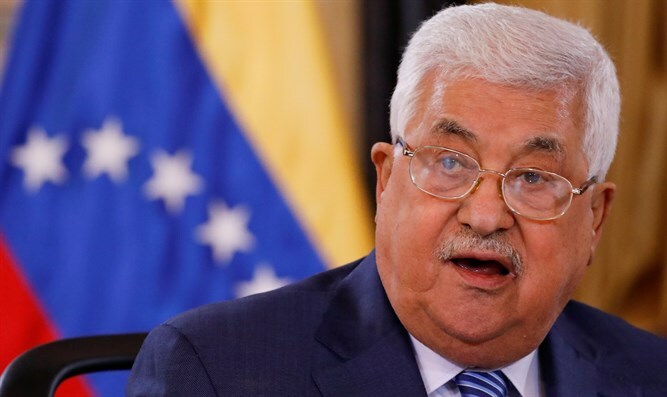 Following his release, conflicting reports circulated, with official reports claiming Abbas had suffered from bronchitis and others saying the hospitalization was the result of a general deterioration in his health. On Sunday, PA reports claimed Abbas was in "excellent health" but did not state a definite release date. "Thank God, I leave here in good health, and I will be back at work tomorrow," Abbas told reporters as he left the hospital. Last week, MK Ahmed Tibi (Joint Arab List) visited Abbas in the hospital, reporting that Abbas suffered from bronchitis and was receiving antibiotic treatment. "There has been great improvement in his condition," Tibi tweeted then. "I walked back and forth with him in the hallway six times. We talked about various political issues. I estimate that he will remain in the hospital for another few days."